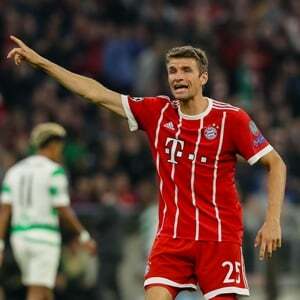 Dortmund - Bayern Munich forward Thomas Mueller has warned title rivals Borussia Dortmund that they cannot afford to slip up as a nail-biting Bundesliga title race enters the final stretch. "They know they can't afford to make any mistakes, because we are in really good shape," Mueller told Germany's top-selling newspaper Bild on Tuesday. Having been six points behind Dortmund at the beginning of the year, Bayern are now level on 60 points with eight games to play, but the defending champions top the table with a superior goal difference. In recent weeks, Bayern have nudged their way into first place on goal difference, having scored 17 goals in their last three games in their bid to win a seventh straight league title. "Obviously they will have noticed that we are winning games by big margins," said Mueller, who has scored six league goals this season with eight assists. "We are happy that we have bent the goal difference numbers in our favour. It's never a bad thing to have that up your sleeve." Bayern host Dortmund at Munich's Allianz Arena on April 6, in what promises to be a pivotal fixture in the title race. "The game against Dortmund will be an indicator of where things are going, but it won't decide the title," said Mueller. "There will be a long way to go after that, and a lot can happen. Especially in the away games, we need to make sure we keep winning."